What is Choice Theory? Developed by psychiatrist William Glasser, Choice Theory states we are motivated by a never-ending quest to satisfy the following 5 basic needs woven into our genes: to love and belong, to be powerful, to be free, to have fun and to survive. Choice theory contends that we are internally motivated, not externally motivated by rewards and punishment. Originally called “control theory,” Glasser switched to “choice theory” in 1996 to emphasize that virtually all behavior is chosen . Choice Theory: What Motivates Us? 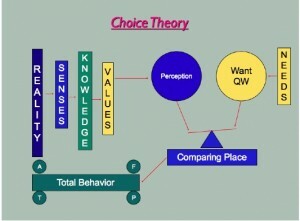 Choice theory represents an alternative to behaviorism and other external control psychologies. Rather than seeing people as “shaped” by rewards and punishment, Choice Theory suggests that we always have some capacity to make choices and exercise control in our lives. Choice Theory teaches that we are always motivated by what we want at that moment. It emphasizes the importance of building and maintaining positive relationships with others to create a shared vision. People who develop shared “quality world pictures” are motivated to pursue common goals and are more likely to work collaboratively. All behavior is purposeful, motivated by our incessant desire to satisfy the basic needs woven into our genes. The strength of each need varies from person to person. For example, some are more driven by the social need to love and belong while others are more driven by the need to be free and autonomous. Each of us develops a unique Quality World, the source of all motivation. Whereas the Basic Needs represent “nature,” The Quality World represents “nurture.” As we live our lives and interact with others, we each build this unique Quality World that includes the people, activities, values, and beliefs that are most important to us as individuals. Everything we place in our Quality World is need satisfying. I feel a sense of power when I am singing on stage. I have fun when I am playing outside with my children. Throughout our lives, we add and delete “pictures” from our Quality World. Some people develop Quality World pictures that are unhealthy and irresponsible. Think of people who only feel a sense of power or freedom when drinking alcohol or taking other drugs. Think of people who have fun when hurting others physically or emotionally. Choice Theory suggests that parents, educators, and the community at large can promote environments that encourage others to develop Quality World pictures that let them satisfy their needs responsibly. Even though we all live in the Real World, Choice Theory contends that what matters is our perception of reality. We behave based on what we perceive to be real, whether we are right or wrong. Because of these filters, two or more people may witness the same event or participate in the same activity and develop radically different perceptions. We may all agree that Barack Obama is president of the United States, but there are multiple perceptions about how “good” or bad” a president he is. Talk to a couple of Red Sox and Yankee fans and you’ll quickly understand that the same “real world” is perceived very differently because of their value filters. The purpose of all behavior is to create a match between what we perceive and what we want. When there is a match, we will maintain the behaviors we have chosen. When there is enough of a mismatch to cause internal discomfort, we automatically search for new behaviors that will create the match we seek. A parent notices that their child is behaving poorly at home and in school. The mismatch between what the parent wants and what they perceive leads them to try new strategies designed to help the child behave more responsibly. When we change any one component of behavior, the other components change as well. The two easiest components to control directly are acting and thinking. It is virtually impossible to change your feelings or physiology directly. Imagine you could feel less sad or depressed just because you wanted to. Imagine a student who is agitated and frustrated and could just calm down because he wanted to. Since all four components work in concert, however, we have much more control over our feelings and physiology than we realize. By choosing to act and/or think differently, our feelings and physiology automatically change. Practitioners of Choice Theory help people choose responsible actions and thoughts that lead them to feel better and positively impact their physiology. When Choice Theory is applied in the classroom, as it has been in schools across the world, it has a significant impact on how instruction is delivered. Glasser contends that teachers need to manage effectively if they hope to successfully teach their students. The role of the teacher/manager is to help students see that working hard and doing what the teacher asks is worth the effort and will add quality to their lives. This is achieved by developing positive relationships with students and providing active, relevant learning experiences where students can demonstrate success. Effective teacher/managers create shared Quality World pictures with their students so students are motivated to learn what the teacher wants to teach. When creating lessons, teachers who practice Choice Theory ensure that students can satisfy their needs by doing what the teacher asks them to do. 1. Coercion is minimized. Rather than trying to “make” students behave by using rewards and punishments, teachers build positive relationships with their students, managing them without coercion. Coercion never inspires quality. 2. Focus on quality. Teachers expect mastery of concepts and encourage students to re-take tests and continue to work on assignments until they have demonstrated competence or quality. The emphasis is on deep learning demonstrated through the ability to apply what has been learned. 3. Self-evaluation. Self-evaluation is a cornerstone of Choice Theory. Given helpful information (rubrics, models, exemplars, etc.) students take on greater ownership of their learning by evaluating their own performance routinely. Encouraging students to self-evaluate promotes responsibility and helps students pursue goals and become skilled decision-makers because they are more actively involved in their education. ← Perseverance and The Relentless Pursuit of McNuggets! thanks for putting together relevent and easy to understant latest trends in educational thought and practice. i shall definitely recommend this for reference. Do increase the content on whole brain learning. Just finished reading “The Classroom of Choice”. Lots of practical suggestions to implement the theory. Thought provoking theory! Can it work when only one classroom in a huge school changes its approach? Naomi…..in answer to your question, a teacher using these ideas in isolation can be successful. However, it’s a difficult journey. If you are lucky, some of your colleagues will notice the success you are having and you can begin to change the way things are done in your school. In my experience, the real excitement comes when a critical mass or an entire school begin to move towards engaging and inspiring (as opposed to rewarding and controlling.) I wish you lots of success! This is my first time i visit here. I found so many useful stuff in your website especially its discussion, From the a lot of comments on your articles. I guess Im not the only one receiving the many satisfaction right here! keep up a good job! I would like to know which book would be best for a 16 year old girl that recently has been diagnosed with depression. I am her mother and have been reading, unhappy teenagers a way for parents and teachers to reach them, it has really helped me releave my anxiety about her by my choices of happiness not unhappiness. I think the first 2 chapters would work for her, but if there is a teen book, I want to purchase that for her. Hi Barbara….I'm glad you have found a resource that you are finding useful for your daughter. 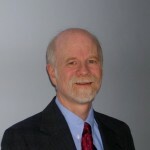 You might want to consider Helping Kids Help Themselves by E. Perry Good. If your daughter is receptive to the ideas of choice theory, she will find this a useful tool. It will help her understand that depression isn't simply something she "has," but something she can manage more effectively. Used wisely, it will help her feel a greater sense of control in her life. When that happens, she'll discover that her depression "magically" improves. Hope this helps. Oftentimes I find it hard to accept that the choices my high school students make are pleasing to them in any fashion. However, remembering that it is all a part of their perception makes understanding come a little more easily. That being said, it leaves a lot of room for misinterpretations. I feel as though my students often are not able to self-evaluate themselves at a level that could be beneficial. It is something I plan on emphasizing more in my classroom this year. As an example, when we learn new vocabulary and use it in the classroom, I ask the students to rate their understanding on a four point scale. This is an academic example, though I think many could benefit even more from learning personal and social ways of self-evaluation. This is a tough statement to understand as well. I feel as though external rewards/punishments can speak to our own internal needs/desires. If they didn't, then they would not be effective rewards/punishments, but to say that we are not motivated at all by such things seems naive. For example, if I knew that if I got all A's, my name would go on a plaque in the hallway, that would be highly motivational to me. It would satisfy my need to feel powerful and my need to belong with the "smart kids." Now on the flipside, if grades were completely kept secret, I would have less of a drive and sense of competition. Am I interpreting this scenario incorrectly? Would there not be an external reward that guides my behavior in some way? Thank you for writing such an interesting article! I’m using this Theory in my work and I see the incredible results. also I’m using this in my blog, http://www.SpeakingTips.ir .